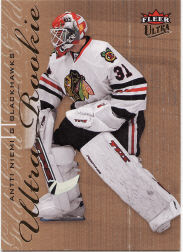 Voice of the Collector: 2009-10 Fleer Ultra Hockey Kicks Off The Season! Hockey is back! Well almost but it’s back in the hobby and Upper Deck has released 2009-10 Fleer Ultra Hockey with some decent rookies, 1 Rookie Redemption card and two memorabilia cards. Not bad for a $60 sticker price, but let’s see what I got! The “Fresh Ink” cards are a tough pull and that’s makes them sought after but the late season rookies have become one of the strong points of the hockey-collecting season. Most of the time the early rookies include some very talented goaltenders and once in a while . . . .